Young adult novelist Kendare Blake’s latest work, “Three Dark Crowns,” is a compelling story that is equal parts “Hunger Games” and “House of Cards.” The complex storyline sets itself up to be an epic fantasy steeped in magic, violence and political intrigue. Although promising from the beginning, by the third chapter the dialogue dries up and the plot turns bland. Only when all three storylines converge in the last third of the book does the action pick up the pace and become as provocative as the synopsis makes it sound. The story centers on three triplets born to be queens, but only one will claim the throne. The three sisters, Katharine, Mirabella and Arsinoe, are all born with a gift of unique magic such as sparking flames and controlling animals. Once the girls turn 16 the “Ascension Year” will begin, where the prospective queens have one year to off their two rivals and claim the throne. The first half of the novel takes place in three locations, the towns where the girls grew up. The setting is meant to build the complicated yet still unformed world Blake has created. The novel opens with Katharine, the poisoner queen who has no gift. However, her powerful foster family has ruled the island for a hundred years and will use any means necessary to keep power. What Katharine lacks in magical talent, her family makes up for by forcing her to acquire a demure, flirty personality that will win the people’s hearts. Another of the queens, Arsinoe, is also devoid of magic. However Arsinoe’s best friend, Jules, is the strongest naturalist in the country, meaning she can control plants and animals. Arsinoe’s constant complaining becomes tiresome and Jules quickly steals any sympathy Blake might have intended for Arsinoe. The third queen, Mirabella, is the only one born with a gift. Her power as an elemental is strong enough to create hurricanes and set an entire forest aflame. Although her power sets her up to be the surviving queen, her unwillingness to kill her sisters inhibits her chances of becoming ruler. While all three queens are relatively weak and uninteresting, the families who raised them are as manipulative and cunning as the queens were meant to be. If Blake were to focus more on these political families and schemes, the novel would have been as compelling as the description. As confusing as the plot is, it is one of the only memorable aspects of Blake’s third series debut. The main characters are seemingly interchangeable and barely characterized to the point of being dull. The secondary characters are far more interesting, as Blake allows the supporting players to have flaws and be wicked, making them layered and more sympathetic. While it is an intriguing premise, Blake gets too bogged down in the details to fully flesh out her main characters and make the reader interested. 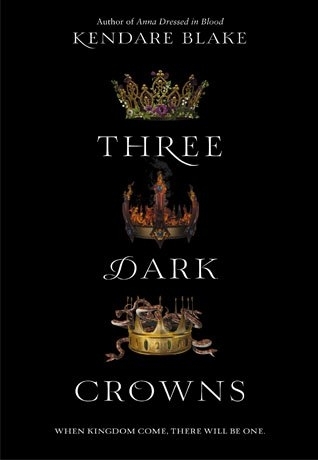 Yet for all of its tedious exposition, “Three Dark Crowns” ends in a shockingly clever twist that may convince you to keep with the new series.